The Grand Canyon of Arizona is one of the most spectacular natural sites in the world. It’s a grand geologic adventure with layer upon layer of rock—brown, red, gray, tan, black—that tell myriad stories of volcanic eruptions, upheavals, and the power of wind and water to carve a deep gorge through sedimentary and igneous rocks. If you’ve seen the canyon from the rim, you understand the immensity of the formations which date back almost two billion years. Layers of sandstone and limestone form vertical cliffs that glow gold and red in brilliant sunsets, drawing visitors to this monument of natural effects and time. 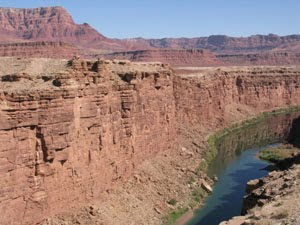 Far below the rim can be seen a winding ribbon of water, the Colorado River, which played a large part in carving the steep canyon called the Inner Gorge. 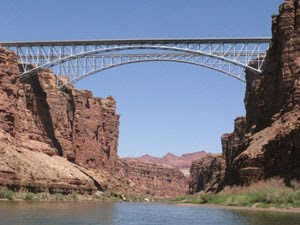 When I first saw this scene more than 10 years ago, I was fascinated by the enormity of this gorgeous site and decided some day to venture down into the canyon and traverse its depths on a raft trip along the Colorado River. I knew the trip would be a stretch for me because I’m not a camper, not fond of roughing it and foregoing usual habits of cleanliness and comfort. But for this adventure I was willing to challenge myself –as it turned out, in more ways that I realized. 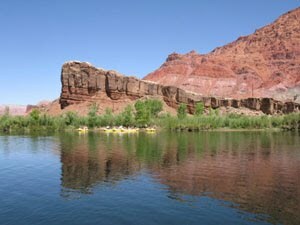 For 10 days our group of 16 travelers and four guides explored 225 miles of river from Lees Ferry to Diamond Creek. 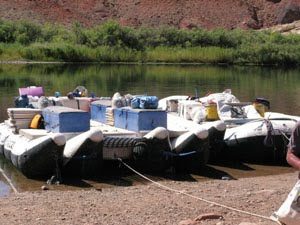 We splashed over 160 rapids large and small, scrambled over boulders and rocks hiking to waterfalls and other scenic sites, brushed sand out of everything we had, pitched and broke camp and loaded and unloaded the boats daily, and marveled at the beauty that surrounding us. It was truly the experience of a lifetime and one that I’ll share with friends and readers through these posts. I hope you enjoy the journey as much as I did.